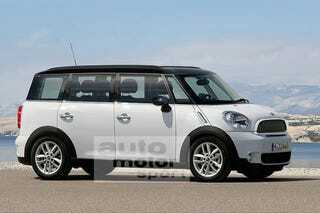 Auto Motor und Sport's joining others claiming BMW will bring a five-seater Mini Minivan to market in 2013. OK Mini, that's enough. Please step back from the sketch pad, put down the brand bastardization crack pipe and slowly walk away. Edmunds Inside Line first dropped the idea of a new Mini Minivan earlier this summer and now Auto Motor und Sport's joined the chorus, roundel-ing up its BMW sources to put together a more realistic-looking rendering of a four-door Hobbit-sized Mini soccer mom-mobile. It's certainly a real possibility considering Mini says the Countryman chassis can add a few inches to the wheelbase without problem. We, on the other hand, do have a problem. We know BMW's got a great brand name in Mini's classic emotional design cues and a fun-to-drive ethos. But now it feels like BMW's trying to cash in on that heritage to use Mini to create their own better-than-Volkswagen brand for the people by building a slew of small, fuel-efficient cars — and even selling them at a premium price. But as the brand's expanded it's threatened the emotional attachment consumers have with it. That's likely a bad thing. Especially if there's any more compromise made in the "fun-to-drive" realm — a realm we already know the Mini Clubman inhabits less of than its smaller Cooper cousin. And that's why we've watched with growing concern as the brand expanded from its core Cooper competency into ever-bigger, -longer and -multi-doored segments. True, they've been here before. Mini once had a van from 1960-1982, but that van was built on the same platform as the Mk 1 MIni — there wasn't a sizable boost in size in order to accomplish it. Also true that we'll be seeing the two-seat Mini Coupe next year and the Roadster the year after — so there's still hope for those of us who love Mini for the go-kart-like nimble ride. Still, we think a Mini Minivan — if it does happen — and if it doesn't maintain the same driving characteristics, Hobbit-like size and design language — is the line on the Bridge of Khazad-dûm where we may have to scream "None shall pass!"